Sony Xperia Z1 Compact goes directly to pre-order in different European countries right after its announcement back in few days ago. 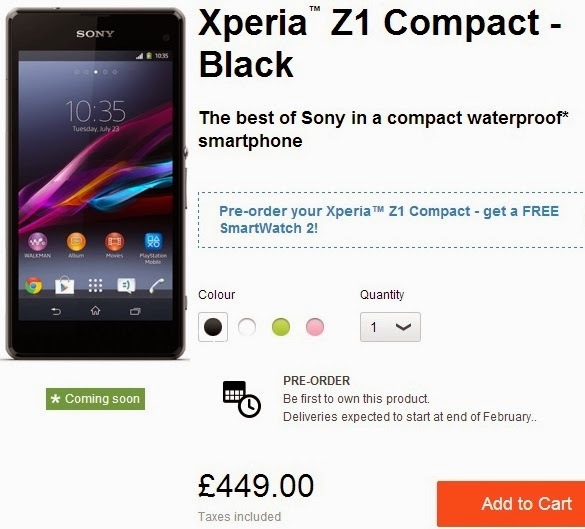 Now Sony is starting to offer various gifts across its EU country online stores for Xperia Z1 Compact pre-order. I checked out several sites earlier and found UK offer very attractive – they are offering free Sony SmartWatch 2 , normally a £130 ($215) gadget. The phone itself is priced £450 ($740). Also in the UK, Phones4u is offering on-contract deals with carriers and throwing in a £120 wireless speaker and up to £65 in movies and music. So your total gain will be £185 ($300) at the end of the day. France is getting a more modest offer – a €50 rebate on the €550 ($750) price of the phone. In the Netherlands buyers will have to pay the full €550 price and get nothing. In Germany, Italy, Spain, Sweden and Poland you will receive free NFC and Bluetooth-enabled headset with every Sony Xperia Z1 Compact pre-order. Z1 Compact is priced €500 or $680 in Germany and Italy, €550 or $750 in Spain, 4700 Korna or $720 in Sweden and 2000 Zloty or $650 in Poland.